In the first of two articles on the creative possibilities offered by computer technology in the studio, Clive Williamson concentrates on Plug-Ins and stand-alone programs designed to go with Digidesign's versatile Pro Tools software. Dedicated computer systems like Pro Tools and Sadie are now at the heart of many editing suites in radio and TV broadcasting, and in post production. These systems provide the power by which sound engineers and producers alike can perform complex audio editing and preparation, or can go further to track-lay, edit and mix complete radio programmes or soundtracks on their desktops. But many users of this technology are just scratching the surface in terms of the creative possibilities it can open up. The new audio software and its associated hardware can be a fantastic facilitator to broadcasters and film-makers alike when extra effects and audio processing options are added in the form of software extensions called 'Plug-Ins', but often the systems are installed with only a basic specification. Hence major opportunities are being missed. It is now possible to save time - and be even more creative - for a relatively small extra outlay! In this article I'm going to examine the extra potential for time-saving and creativity offered by desktop audio, and I'll be concentrating on Digidesign's Pro Tools system running on Apple PowerPC computers, because Pro Tools has undoubtedly generated the most interest amongst third-party developers so far! There are masses of ingenious, inspiring and intriguing add-ons for Pro Tools in both hardware and - as I'm primarily concerned with here - software. From and early stage, Pro Tools software was written with expansion in mind, and has been designed to accept upgrades in the form of Plug Ins produced by both Digidesign and third-party developers. Plug Ins for Pro Tools come in one of two types: AudioSuite - where processing is carried out 'destructively' on audio files held on hard disc before the mixing stage; and TDM - which are preferable because they can be auditioned in real time and work non-destructively. However, they do require additional processing power from dedicated DSP chips. These are held on extra 'DSP Farm' cards plugged into the host computer's PCI (or older Nubus) slots. Each card can normally handle four effects at once. 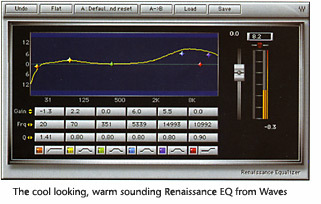 Both types of Plug In can add enormously to the versatility of Pro Tools itself and often enhance its creative potential by adding things like:'intelligent' noise reduction; powerful EQs; clean compression; high quality reverb; time-based effects; pitch-changing; and some extraordinary spatial and special effects. TDM Plug Ins can be inserted into individual mono or stereo tracks, or fed from an AUX bus within Pro Tools, and many of their parameters can be automated. Using a Plug In is like plugging up an external rack effect, except that the whole thing is 'virtual', requires no extra wiring, and stays in the digital domain, thus ensuring minimum fuss and maximum sound quality. So where to begin? Well, the brief of this article is to find things that boost both productivity and creativity, so before I investigate any Plug Ins I'd like to mention some stand-alone programmes which can really help in broadcast and post applications. First is CDStudio, an invaluable software gem from UK company Gallery. This application grabs tracks or regions from effects and music CDs and transfers them onto your hard drive at up to 12 times speed. A number of useful options are available during the copying, including identifying index points, simultaneous sample-rate change to 48 kHz and the creation of split stereo files. CDStudio is included as part of Gallery's SampleSearch AudioToolkit, a networking solution for Pro Tools users, and they also make the handy SessionBrowser, which allows spotting into Pro Tools, file copying and management and batch sample rate conversion. Gallery are relatively unknown in the UK, but are 'big in L.A.', where customers include Skywalker Sound, Sony Pictures and Universal. Another British company, Synchro Arts, is responsible for Titan, which incorporates 'Flash Conform' and 'Flash Cutter', which uses a standard EDL from any editing system to automatically recreate and name audio regions into a new Pro Tools session. This software also features a 'Fix Sync' function to automatically adjust the position of manually or auto-conformed audio regions to sync precisely to a work track, or to correct the sync of delayed audio that has been passed through processing devices. Synchro Arts will already be familiar to some Pro Tools users for VocALign, an extraordinary programme which piggy-backs onto Pro Tools to achieve fast and easy synchronisation of audio, and is specially useful for lip-syncing and foreign dialogue replacement. Less well known, but equally useful is their Toolbelt, which can time compress and expand, reverse or invert digital audio. It also allows sections of sound to be looped or sampled and then regenerated using Chaos Theory to create extended backgrounds from tiny sections of atmosphere. Personally, I found VocALign and Toolbelt to be far from intuitive, but the end results more than make up for the need to read and learn the manuals! Next on the shopping list for the well-equipped virtual studio come the Plug Ins. Assuming you've transferred your audio, you'll probably want to tidy it up a bit first! Digidesign's Intelligent Noise Reduction (DINR) software could come in useful here. I first reviewed it in Line Up in December 1996 when processing nature sounds from New Zealand with Sound Designer II software, and the latest TDM version of DINR is even better at analyzing and removing unwanted sound from digital audio files. Then there's the handy little DeClicker from Steinberg, which can remove digital clicks, mask short tape drop-outs and help restore transfers from vinyl. Next comes EQ, and I'm particularly fond of the Waves products. Their Q10 Parametric EQ is precise and functional, allowing different EQs for each channel when processing stereo files, while the newer Renaissance Equalizer has cooler look and seems to sound richer and a touch more musical. Digidesign helped to bring Focusrite's Red Range 2 Dual EQ (designed by Rupert Neve) into the digital domain in Pro Tools as the f2, and this appeals for both its familiar looks and its quality sound. If your source material still sounds dull you could try the TDM equivalent of the Aphex Aural Exciter for some highly useful audio sweetening. Changing tack somewhat, Antares Auto-Tune is astonishing at correcting the pitch of vocals or instruments while playing them back, and my favourite pitch-shifting and time stretching program is Mark of the Unicorn's PureDSP. 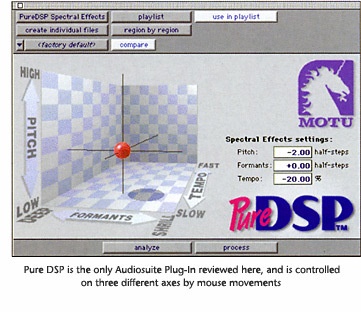 This only comes in an AudioSuite version, but it does an amazing job of extending or compressing time, and can analyze files to produce excellent results when changing overall pitch, including the ability to alter the vital sound formants by a different amount (it is possible to do 'gender-bending' with this software), or leave them untouched to avoid any unwanted 'munchkinizing' effects. When it comes to reverb for mix-downs, there are good offerings from Digidesign (D-VERB), Lexicon (LexiVerb) and TC's TC|Reverb, which comes as part of TC|Tools. I'm very impressed by Waves TrueVerb, with its unique 'distance control' to allow sounds to be moved back in the sound stage with psycho-acoustic precision. Other useful mix-down 'tools' are the simple but powerful Renaissance Compressor which seems to retain a good sense of dynamics, even with extreme settings, and I also like the competing Focusrite d3. Both can be keyed by side-chains for voice-over working, and the d3 is particularly economical on DSP. Many of the Plug Ins listed so far can also earn their keep when mastering the resulting audio - particularly the exciter, EQ and compression - but there are a couple of other goodies which come into their own at this stage. Aphex do Big Bottom, which adds punch and clarity to the bass frequencies, and Waves' MaxxBass is great for this too. Waves also do the S1 Stereo Imager and PS22 Stereomaker, both of which can boost the apparent separation of stereo sources. It must be said that all the software mentioned here is worthy of a full review in its own right! I've chosen my favourites based on ease of use, innovation and sound quality, so they are all worth checking out for yourselves! A full list of developer's websites is given below, and many have demos to download and audition. Most of the TDM Plug Ins reviewed here are also available as AudioSuite Plug Ins which can run on less well specified Pro Tools systems using Digidesign's Pro Tools software, or can be added to MIDI sequencing and digital audio recording software such as Emagic's Logic Audio Platinum. A good Pro Tools set-up really can be a source of inspiration, and in the next issue of Line Up I'll be examining some more great Plug Ins with the accent on creative sound design. In Part 2, Clive investigates more radical uses of Pro Tools and shows how a hands-on approach to synthesizers, samplers and MIDI can help create original effects for broadcast and post production. Title graphics by Clive Williamson using Adobe Photoshop and Kai's Power Tools software. Words and original graphics (c) Clive Williamson, 2000.